C program to find the frequency of characters in a string: This program counts the frequency of characters in a string, i.e., which character is present how many times in the string. For example, in the string "code" each of the characters 'c,' 'd,' 'e,' and 'o' has occurred one time. Only lower case alphabets are considered, other characters (uppercase and special characters) are ignored. You can easily modify this program to handle uppercase and special symbols. Explanation of "count[string[c]-'a']++", suppose input string begins with 'a' so c is 0 initially and string = 'a' and string - 'a' = 0 and we increment count i.e. 'a' has occurred one time and repeat this till the complete string is scanned. 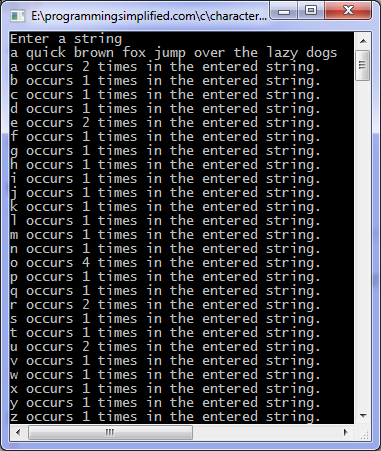 Did you notice that the string in the output of the program contains every alphabet at least once? 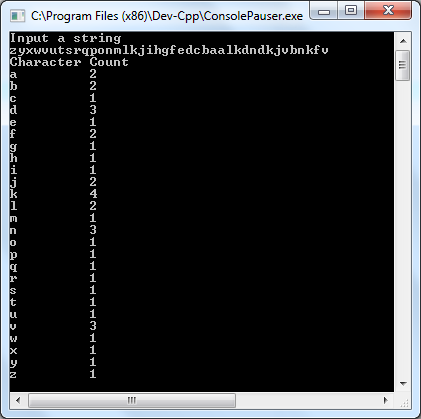 We will make a function which computes frequency of characters in input string and print it in a table (see output image below). We do not pass no of elements of array count to function find_frequency as they will always be 26 if considering only lower case alphabets. But you can pass if you wish to do so.